Which lesson is for me? Lessons are sold as either a GROUP LESSON, GROUP PACKAGE or PRIVATE LESSON. PRIVATE LESSON: Would be just you and anyone else you wanted with you, up to (4) people total. A group of people taking a Private Lesson should be of similar age, ability level and on the same equipment, Skis or Boards. Instructors will teach to the slowest person in any group. GROUP LESSON: When you purchase a GROUP LESSON, you purchase just the LESSON. Equipment rental and lift tickets are additional. Someone who has never tried skiing or snowboarding before. Someone who has been introduced to snow sports but is not able to stop, make linked turns. You may or may not have been on a lift. Someone whose friends took them to the top of the mountain on their first outing and things did not go very well. Someone who skied or boarded many years ago. You may have never had a professional lesson and are starting over to learn snow sports. Someone who has skied or boarded before but for whatever reason feels that it is best for them to start from scratch. Anyone who is skiing or riding at a “minimum” on GREEN runs. They are able to turn making consistent and controlled linked turns without stopping every few turns. They are able to stop, control their speed and are able to ride a lift. Anyone at any level, First Timer to Expert, who values the personal attention that a one-on-one experience provides. Anyone who wishes to share the experience with up to (3) of their friends of similar age, ability level and outcome expectations. And everyone must be on the same equipment, Skis or Boards. The colors and symbols that describe a ski run’s difficulty differ somewhat at the 2,000 resorts in North America, Europe, Japan and New Zealand. U.S. and Canadian resorts use a color-shape rating for ski trails, while skiers throughout the rest of the world rely on a color-coded system. 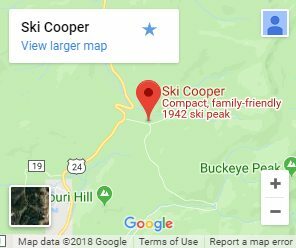 It is important to remember that ski resorts subjectively assign their own trail ratings. In other words, a blue run at one resort may be more or less difficult than a trail with the same color designation at another mountain. In North America, trails marked with green circles are the easiest runs on the mountain. These trails are typically wide with a slope gradient of less than 25 percent. Important: The GREEN runs at Cooper are marked green, because they are the easiest runs at Cooper. At many other resorts, these runs would be marked BLUE! The BLACK runs at Cooper are marked black, because they are the most difficult runs at Cooper. At many other resorts, these runs would be marked BLUE. Trails with blue squares at North American ski resorts indicate intermediate difficulty. With grades of 25 to 40 percent, these ski runs tend to be the most numerous and most heavily used. Ski trails marked with a black diamond at U.S. and Canadian resorts are considered to be difficult, typically with steep gradients exceeding 40 percent. Double black diamond trails are for experts Only! Exceptional experts should try triple black diamond runs like Black Hole at Vermont’s Smuggler’s Notch. Orange rectangles with rounded corners typically are used to designate terrain parks that feature jumps, half-pipes and other specialty obstacles.